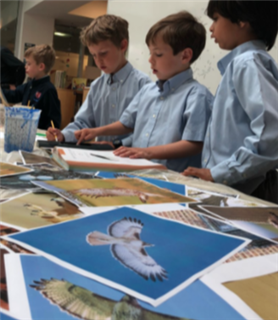 Sukey Bryan, the Artist-in-Residence at Grace Cathedral, whose work "Burney Falls" currently adorns the Great Steps of Grace Cathedral, will be working with every Cathedral boy to create a Great Hawk Float. Religion classes K-8 will rotate through a special workshop, and will paint color panels which will be fastened together to create the Great Hawk Float structure. Once finished, The Great Hawk Float will be displayed at the School (location TBD).